Did you ever make huts or a fort when you were little? I remember my brothers always used to make forts/huts and they wouldn't let me play in theirs, so I made my own in my room. Looking back now I don't think Mum was too impressed with us using every single blanket and sheet in the house! (sorry Mum). The girls were very excited about building a fort/hut...Miss B and Paige drew up their plan and got stuck in to renovating our lounge - using most of the furniture, luckily I kept a chair for myself to sit on while they played (note: they used the coffee table instead of the kitchen table). They used the couch covers to cover their fort/hut (which was actually perfect - as it saved me from having to re-fold all the sheets and blankets that they would have used). The girls put the couch cushions on the floor and put a blanket on top, they grabbed their pillows & blankets from their beds, the laptop & rainbow loom and they were sorted! Enjoying their fort/hut - they even had Master M in there for a look around and play :) Our cat Smooch thought it was awesome too! 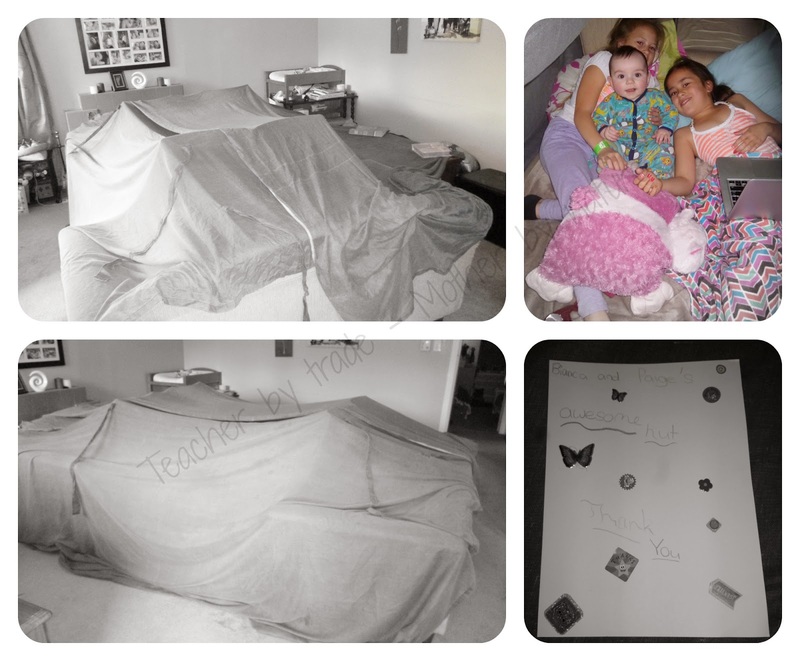 Have your kids made forts/huts in your house?